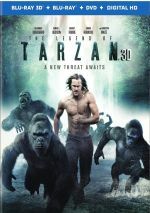 Having acclimated to life in London, Tarzan is called back to his former home in the jungle to investigate the activities at a mining encampment. More than a century has passed since Edgar Rice Burroughs published his first Tarzan story in 1912, and literally hundreds of film adaptations have followed. The first came out in 1918, and the latest hit screens almost 100 years later, as 2016 brought us the ape-man’s most recent incarnation. As a child, British noble John Clayton III lived in Africa with his parents. When they died, local apes raised him, and as an adult (Alexander Skarsgard) he met/fell in love with Jane Porter (Margot Robbie), the American-born daughter of an educator. We find now-married Clayton – formerly known as “Tarzan” – in England, where he returned to “civilization” and settled down with Jane. Set in 1890, Belgium takes control of the Congo Free State, and emissary Leon Rom (Christoph Waltz) meets with Congolese Chief Mbonga (Djimon Hounsou) to ensure the easiest control of the natural resources. Chief Mbonga demands one concession before he’ll agree: Tarzan needs to return to Africa. Urged to go by British leaders who hope to stake their own claim of these materials, Clayton initially declines. However, when notified by American representative George Washington Williams (Samuel L. Jackson) of potential enslavement that impacts the Africans, Tarzan and Jane return to the land to save the day. I admit I find Hollywood’s continued fascination with the Tarzan story perplexing, and only partly because the character/situations never did a lot to interest me. Even if I ignore my personal preferences, Tarzan simply seems like a character firmly bound to another era and not one who suits modern sensibilities well. While Legend takes place in the past, it does try to update the tale in a variety of ways, especially in terms of action/visuals. The movie’s opening battle between the Belgian soldiers and the Congolese natives quickly tells us that we’ll get a flick that matches with 21st century styles. Which is a good thing – I guess. On one hand, I suspect Legend will look dated before long, as it makes a number of visual decisions that fall into the “flavor of the week” vein. On the other, I’m glad the movie attempts to jazz up the tale. 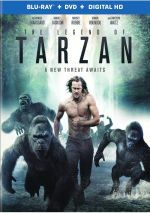 Most Tarzan movies tend to feel constrained, so I’m pleased this one gives the narrative a livelier attitude, even if the movie may not age well in the long run. I’m also happy that Legend doesn’t act as the standard “origin story”. 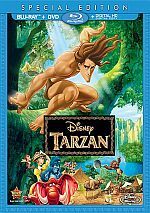 I expected the film to go the same route as Disney’s 1999 adaptation, wherein we meet Tarzan as an infant and trace the usual “me Tarzan, you Jane” path. Because Legend opens with Tarzan as an adult and back in England, it delivers a different vibe. Not that it ignores the history, though. Legend delivers the information about Tarzan’s African upbringing – it just accomplishes this via flashbacks. Because most of us know the story, I would’ve preferred that the movie keep references to Tarzan’s origins unseen, but the use of the occasional flashback acts as a decent compromise. Despite these positive moves, Legend ends up as a limp take on the material, as it rarely threatens to come to life. Much of the movie offers a “by the numbers” feel – we get plenty of scenes that should excite/entertain, but they come across as oddly limp and lackluster. It doesn’t help that Legend sticks with a trite plot. Much of the film revolves around Tarzan’s attempts to rescue Jane from Rom, and that gets old. It means the film badly misuses Robbie. Normally a vibrant, lively actor, Legend forces her into a box – almost literally – and leaves her as nothing more than the stereotypical helpless girl who needs to be saved. Legend even winks at this concept, as Jane refers to herself sarcastically as a “damsel”. The fact the movie understands its cliché use of the character doesn’t free it from those pitfalls, though – and the self-knowledge involved might make the lack of creativity even more frustrating. Whatever the case, Robbie never manages to add life to her one-dimensional character, and Waltz plays another in his series of gentlemanly villains. Legend attempts to give the Jane/Rom relationship a vibe akin to Marion/Belloq Raiders of the Lost Ark, but it flops. Skarsgard never becomes an interesting hero. He looks great in the part but lacks much charisma. Tarzan shows the requisite physical characteristics but doesn’t turn into an engaging personality. At no point does Legend threaten to give us a genuinely bad film, but it simply can’t muster much to spur enthusiasm. Though the movie boasts a few creative touches, much of it feels predictable and trite. Even its action sequences fall flat and leave this as a wholly mediocre experience. The Legend of Tarzan appears in an aspect ratio of approximately 2.40:1 on this Blu-ray Disc. Overall, the image seemed positive. Most of the time, the movie gave us a good sense of definition. Low-light shots could feel a little tentative at times, but the majority of the film boasted nice clarity and delineation. I saw no moiré effects or jagged edges, and I also detected no print flaws. Legend opted for desaturated hues that varied based on setting. These mixed blues and tans for the most part to create a limited but satisfactory presentation of colors. Blacks seemed deep and dense, while shadows offered appropriate thickness. Though not excellent, the transfer still seemed very good. Even more pleasing, the movie’s Dolby Atmos soundtrack soared. Downconverted to Dolby TrueHD 7.1 on my system, this mix used the channels in an active and engulfing manner, particularly during the many sequences set in the Congo. Those announced their intentions early when we saw the Belgian army against the locals, and the mix of shots that involved Tarzan and animals brought the track to rousing life. Add in a few more combat sequences and this turned into a rich, involving soundscape. Audio quality also satisfied. Speech threatened to get buried at times but remained concise and distinctive, while music showed warm, lively tones. Effects came across as vibrant and dynamic, with excellent low-end response. The audio added a lot of zest to the film. In addition to the standard 2D visuals, this set also provides a 3D Version. The technical comments above connect to the 2D edition – how did the 3D Legend compare? In regard 3D effects, the movie offered decent material. Much of the image emphasized depth and perspective, but a few more impressive bits emerged. Scenes with animals added flair, and we got a few fun “pop-out” moments such as those that involved vine-swinging. The 3D elements didn’t contribute a lot to the film but they gave it occasional pep. Picture quality was typical for 3D. Sharpness took a minor hit, and the 3D version looked a bit darker than the 2D edition. Both of these were expected and modest. In terms of preference, I think it’s a draw. The 3D effects brought out a little extra zest but the mild decline in picture quality acted as a counterbalance. I won’t steer viewers away from the 3D version – but I won’t endorse it very strongly, either. The package offers five featurettes. Tarzan Reborn runs 15 minutes, 10 seconds and presents comments from director David Yates, producers David Barron and Jerry Weintraub, screenwriter Adam Cozad, physical trainer Magnus Lygdback, movement choreographer Wayne McGregor, African technical advisor Josh Ponte, executive producer Nikolas Korda, costume designer Ruth Myers, and actors Alexander Skarsgard, Samuel L. Jackson, Margot Robbie, and Christoph Waltz. “Reborn” examines story/characters, cast and performances, historical elements, allusions to prior films, and costumes. Nothing especially meaty emerges here, but “Reborn” gives us an acceptable overview of production basics. During Battle and Bare-Knuckle Brawls, we get three pieces: “Tarzan vs. Akut” (5:15), “Boma Stampede” (4:53) and “Train Ambush” (4:57). Across these, we hear from Skarsgard, Yates, McGregor, Barron, visual effects supervisors Tim Burke, Frank Petzold and Alex Pejic, stunt coordinator Buster Reeves, 2nd unit director Stephen Woolfenden, special effects supervisor David Watkins, and visual effects animation supervisor Kevin Spruce. These clips examine the execution of a few effects-intensive scenes from the movie. The “Battle” bits bring us good details, and the behind the scenes footage adds a lot. Next comes Tarzan and Jane’s Unfailing Love. It takes up six minutes, one second with info from Robbie, Yates, Skarsgard, McGregor, Barron, Cozad, and Korda. As expected, “Love” looks at the Tarzan/Jane relationship as well as performances. A couple of minor tidbits emerge but the piece usually seems blah. Creating the Virtual Jungle goes for 15 minutes, 16 seconds and delivers material from Yates, Robbie, Woolfenden, Burke, Petzold, Skarsgard, Robbie, Spruce, Pejic, McGregor, production designer Stuart Craig, animal performance artist Ace Aristotle, and actors Djimon Hounsou and William Wollen. “Virtual” tells us the methods used to reproduce the African locations/creatures in a London soundstage setting. This turns into a satisfying program. Finally, we locate Gabon to the Big Screen. It lasts two minutes, 28 seconds and features Yates, Jackson, Ponte, Waltz, Skarsgard, and Robbie. It’s basically an ad for Gabon and a way to raise awareness about the elephant population crisis. The disc opens with an ad for Kong: Skull Island. No trailer for Legend appears here but we do find an anti-ivory PSA with Skarsgard and Robbie. A third disc provides a DVD copy of Legend. It lacks any of the Blu-ray’s extras. Though The Legend of Tarzan starts with some intriguing choices, most of it follows a predictable path. Despite its stabs at action and excitement, the movie fails to generate any real heat. The Blu-ray offers very good picture and audio along with a handful of supplements. Legend fails to reinvent Tarzan in a compelling manner.